The article describes an idea for interplanetary space travel using nuclear bombs. The bomb detonates behind the spaceship and the shockwave propels the ship forwards. You can see it in the picture above. The nuke detonation is on the right and the spaceship is shooting away to the left. 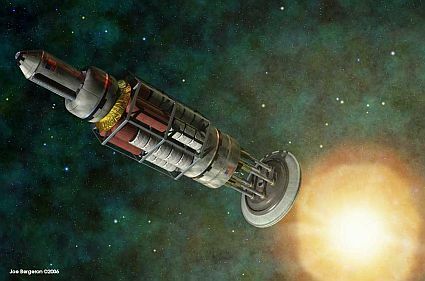 The idea was thought up in the 50’s and dubbed Project Orion back then. Whenever I read space opera books when I was a kid my dad would talk about Project Orion as the only feasible means of really getting between different solar systems. Space opera books always have some means of getting between solar systems with faster than light travel (FTL). FTL is accomplished in the books in different ways depending on the books, but all of them have some sort of dimension bending idea behind them. The simplest one that actually explained it had the spaceship travel through the fourth dimension. We perceive the world in three dimensions, but what if there was a fourth that we don’t see? How would a fourth dimension let you travel rapidly through three dimensional space? It’s easier to understand if you imagine a two dimensional space, like a piece of paper. 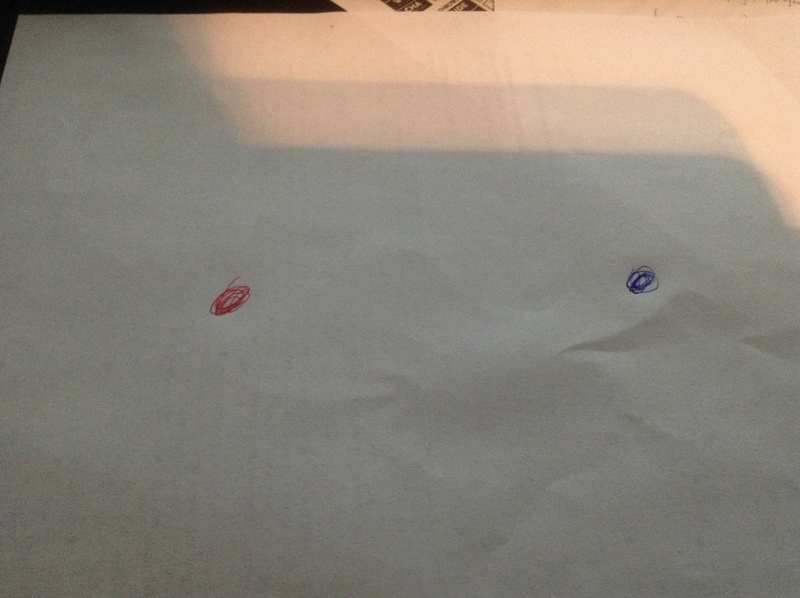 The paper has two dots on it. Normally you’d have to draw a line across the whole paper to connect the dots. 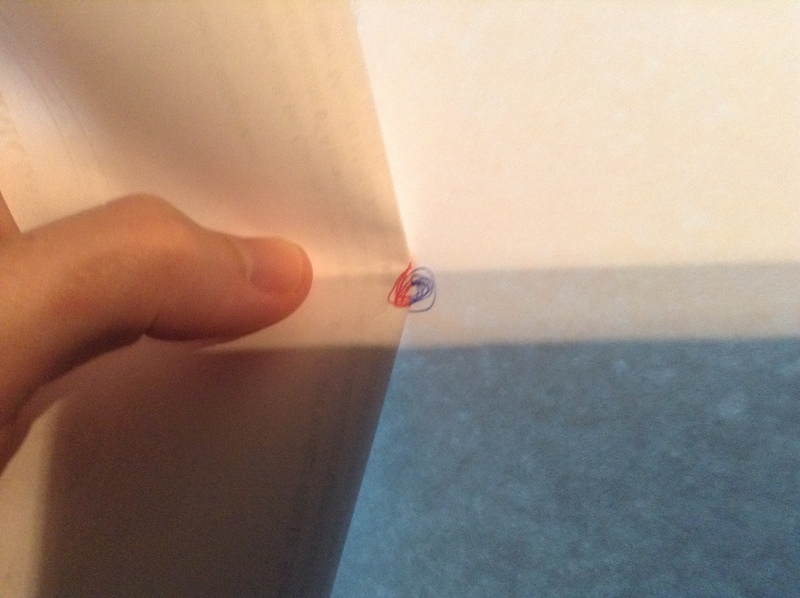 But what if you fold the two dimensional paper through the third dimension to connect the dots? Now going between the dots takes almost no time at all! The same principle applies for FTL in some science fiction stories. Space is folded in the fourth dimension to allow faster three dimensional travel. We may eventually discover dimensional travel like that, but for our best plan for getting to other solar systems is using up a country’s nuclear arsenal to blow a spaceship across the galaxy. A still from one of DarkMatter2525’s videos on Genesis. Today I found this series of videos on Youtube made by DarkMatter2525. His videos look at Biblical stories from a modern perspective. Is the same logic that was true thousands of years ago true today? What happens if you look at the mythological stories from a different perspective? One of the ones I’ve watched so far is about how the world would’ve turned out if Adam and Eve never committed original sin. Since death doesn’t exist without sin, the world just fills up with people until there is a second crust around the Earth made of animals and people. The people don’t need to eat because they can’t die. Eventually God gets fed up and force feeds Adam the apple. The point DarkMatter2525 was trying to make is that Creation makes no sense if original sin isn’t included. People would multiple with no end and a lot of the carnivorous creatures that are designed to eat other creatures would seem odd in a world where such an act isn’t possible. Why does a lion have sharp teeth and killing claws if it doesn’t hunt its prey? 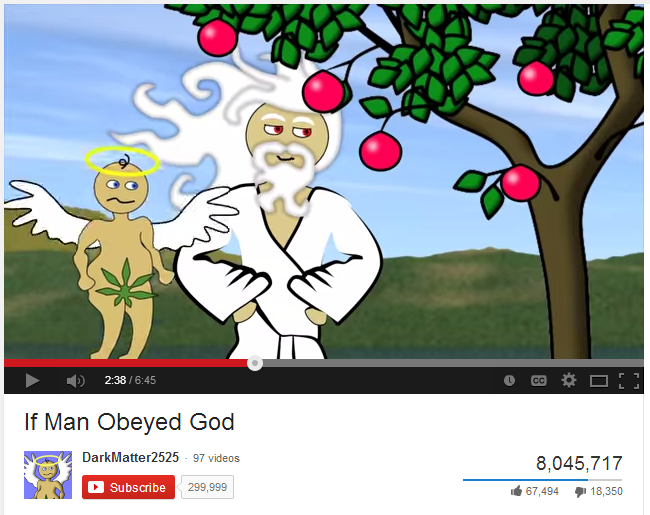 I grew up watching Veggie Tales videos at my friend’s house, so its especially interesting for me to see cartoon Biblical stories from a more adult perspective. Me playing around a little on my monk to show off for the blog. Sundays are typically D&D night for my friends and me, but we didn’t play for a couple of reasons. One of my friends couldn’t make it and two others had to be in and out for a few reasons. So instead of D&D we played video games! League of Legends is a popular one. We also did a little bit of Warlight. 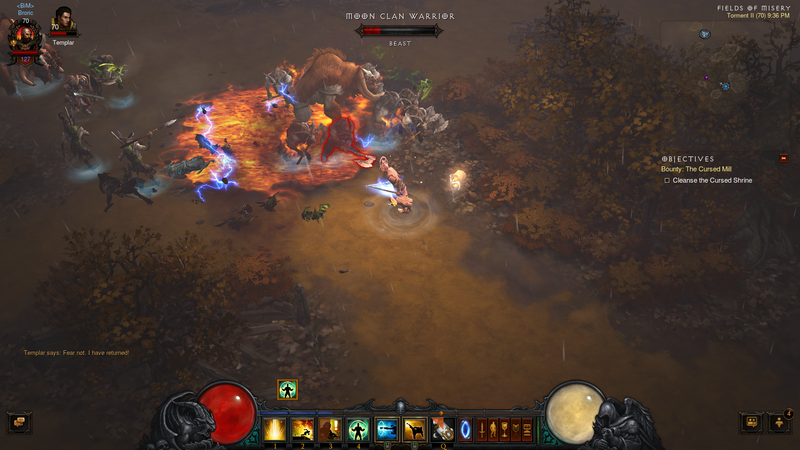 We also showed Diablo 3 off to one of our friends who hadn’t played it yet. The original Diablo game came out in the 90’s and gained amazing success. Diablo play focuses around killing monsters and collecting the magic items that fall from their bodies. The magic items are stuff like shields, hats, rings, swords, shirts, etc. All stuff that your character wears in the game. The game has a interesting story to play through, but after that’s been done the goal moves from the story to collecting more magic stuff. There are certain extremely powerful magic items called legendary items. The later goal of the game is collecting the perfect set of legendary items to make your character the most powerful that it can be. At least that’s the goal for me. Other people can, of course, have separate goals for their own character if they wish. The original Diablo game was so successful within its genre that subsequent games that use a similar interface and magical item system have been called Diablo clones. Diablo 2 quickly outsold the first Diablo and the third game has done even better than that. I started playing with Diablo 2 around when its expansion pack came out. I’ve recently got back into playing Diablo 3 because its expansion pack was just released last month. Diablo 3’s biggest improvement for me is the ease of playing with your friends. Diablo 2 had a few minor barriers to playing with your friends. Diablo 3 has no such barriers. You literally just click one button to join your friends in a game. Playing with my friends makes the game a lot more fun. I probably wouldn’t have picked it up again if playing with them wasn’t an option. 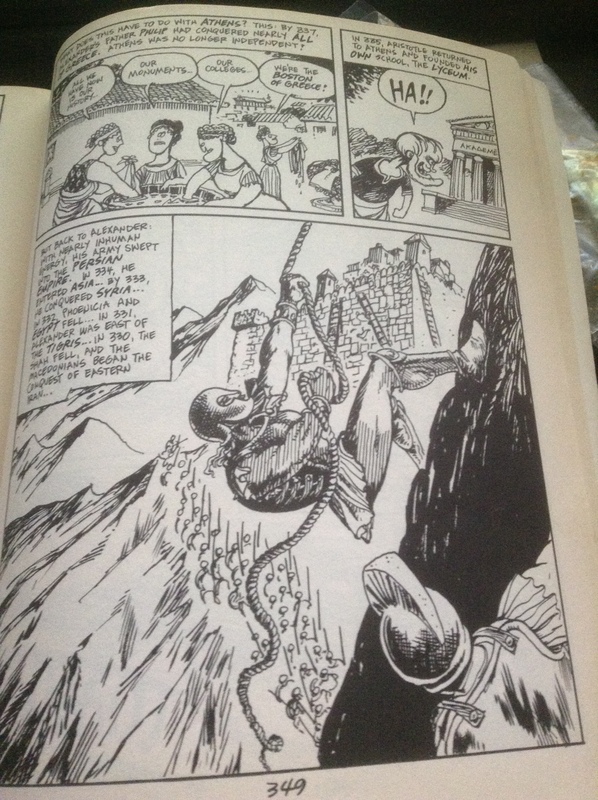 One of Larry Gonick’s few realistic drawings depicting Alexander the Great capturing the Sogdian Rock. Today I talked with the Classics professor who has been helping me with the paper I’ve been writing on Alexander the Great. I finished the final edits on my paper for resubmission and I wanted to go over them with a professional. We made a few more minor edits and I will resubmit once I pull all the copies together, make a CD copy, a new cover letter, etc. I wanted to talk about how the submission process works for papers in academic articles. First you submit whatever they require to the editor. The Journal of Popular Culture (JPC) that I’m submitting to wants three hard copies of the paper, a CD copy, a cover letter, and a return envelope. The editor reads the paper to ensure the topic matches what the journal is about and isn’t horribly written. The JPC wouldn’t publish a paper on math theory for example. If the paper is on topic it is sent out to two or three professionals in the field. These professionals are often professors of that topic. The professionals review the paper and give their recommendation to the editor. The recommendations come in four different flavors. First, they can reject outright. The paper is rejected and will not be accepted ever. Second, they can reject but ask for a resubmission. This is what I got. It’s also the most common response to any paper. Third, they can accepted with a few edits. This is for when a few words are misspelled or there’s a grammar mistake. Fourth, they can accept without any additional work needed. This rarely happens the first time a paper that is submitted to an academic journal. I got reviewed by two people. One accepted it as is (AWESOME!) and one rejected it, asking me to resubmit after I’d removed some generalizations I’d made. So now I resubmit. The editor will look at it again. The editor will decide which reviewers to send it out to a second time. She could pick the same two as before, only one from before, or new people. That’s up to her though. For now, I just have to get it in the mail! 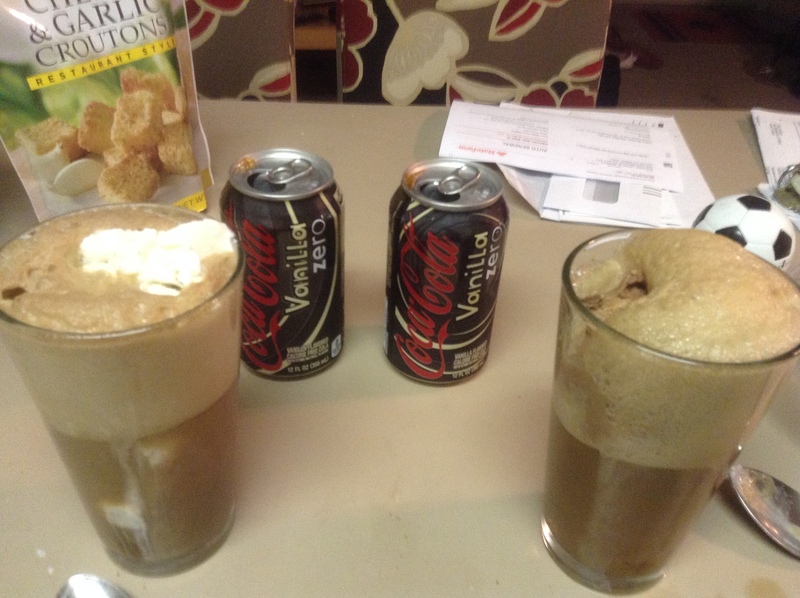 Two Coke floats my wife and I made. I wanted two root beer floats tonight, but we didn’t have any root beer in the house. I made Coke floats instead. We only had enough vanilla ice cream for one float, so I used chocolate in the other one. They were not really root beer floats, but they were really nice. And apparently my wife never had a root beer float, so this was her first experience. The floats were an end to a long day which involved: getting fewer privileges at work, trouble shooting a problem at work, talking about relationships, having a birthday lunch with a friend, organizing vacations, doing laundry, cleaning cat poo, and at the end I got floats! Previously I had thought it was alright to watch Youtube videos at work while I sorted seeds. Boss said no today. I’m disappointed, but its not unreasonable of him to ask this. Isolating DNA from rice leaves hasn’t been going well. We’ve been getting errors and we finally narrowed down the error to a salt we use. The stock salt we use to make the salt solution looked dirty though. I cleaned it. We’ll see if it’s good next week. I talked with my coworker while sorting seeds about his future plans with his girlfriend. He wants to move in with her, but she thinks marriage is the next step. They’ll probably just live close to each other next year. Right now they live around an hour apart. One of my old friends from my organic chemistry class sophomore year had a birthday today! I took him out to lunch at Taco Bell (he chose it). We talked about life and stuff. It was a lot of fun! When I got home I organized my Memorial Day vacation with my father-in-law. Another old friend, from high school this time, wants to hang out on the actual Monday of Memorial Day weekend. Organized stuff to make it work. Laundry and cleaning the litter box are pretty typical chore things. And chocolate ice cream in vanilla Coke to end the day! This is what my computer captures under my microscope when I inject a worm. I gave an extra post about one of my jobs. It seems fair to cover the other job as well at some point! I study introns in C. elegans worms, but how do I get the specific introns in the worms? I need introns in specific placements in specific genes in order to study them with scientific accuracy. The gene we are studying is simple. If the worms are put in a solution called X-gluc, they turn blue. Based on where our enhancing intron is in the worm we expect it to turn more blue if the intron is closer to the start of the gene or less blue if it is near the end. So I have these genes that I’m putting into the worm. They get in by injecting them like you see in the picture. The needle of DNA is aimed at the gonad of the worm. C. elegans worms are hermaphrodites. They contain sperm and eggs and they self-fertilize. The worms are “male” at first, producing a bunch of sperm. Later on they produce eggs and then they fertilize their own eggs with the sperm stored in their body. Since they contain both genitalia the whole area is referred to as the gonad. I aim my injection at the gonad, hoping that the DNA I’m injecting will get into the fertilized eggs. Then the injected worm is put on a plate with lots of food and I hope that its babies will have the injected DNA. But I don’t test for “blueness” immediately. When a worm is first injected, the DNA is inside its cells, but not necessarily integrated into the cell’s chromosomes. I need the DNA to be a part of the chromosomes. There are only two genes in the mix of injected DNA that will integrate. One gene is the blue gene, called GUS. The other gene is called unc119. Unc119 is to “recover” the worms. 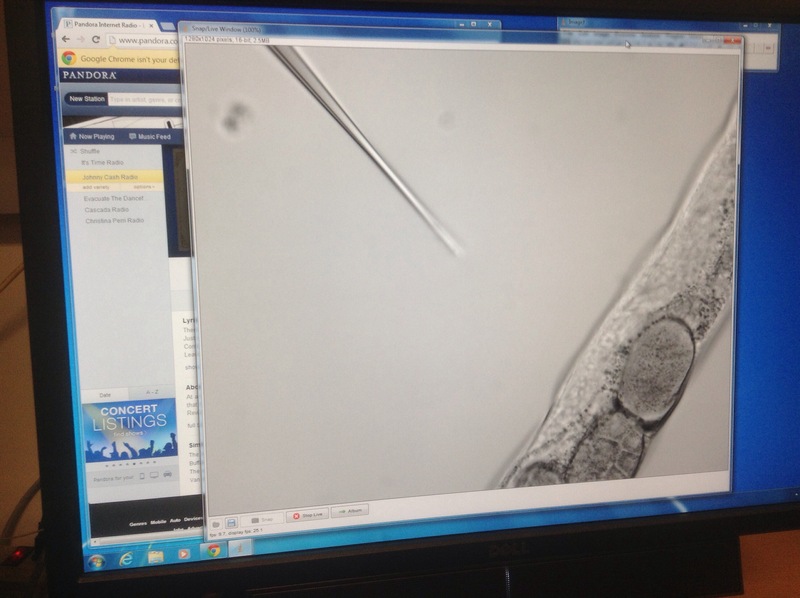 The worms I inject lack unc119, which is a normal gene for worms. In a natural wild-type worm unc119 aids the development of the worm’s neural network. Without it, the worm has poor neural connections and has a lot of trouble even moving around and eating. So the first way I test a successful injection is by looking to see if the babies of the injected worm are moving around normally or flopping around. The normally moving ones were successful and now have unc119. They are “recovered” back to their natural wild-type state. The floppy crippled ones did not have a successful injection. Either I missed the gonad, I didn’t inject enough DNA, or the eggs that got my injection didn’t fully germinate. There are other markers I use to see if an injection was successful, but I’ll get to those later! A friend of mine posted an article on Facebook recently about collecting methane from cows. Most people are familiar with carbon dioxide (CO2) as a greenhouse gas, but there are two other big ones, water (H2O) and methane (CH4). Water is the preferable one. It only has a large greenhouse gas effect because there is so much of it. Methane actually has a larger greenhouse gas impact than water or carbon dioxide if one molecule is compared to another (30x that of carbon dioxide). The good thing about methane is that it only stays in the atmosphere temporarily. Carbon dioxide never leaves the atmosphere. Methane takes about ten years to degrade into a carbon dioxide molecule and two water molecules. During those ten years methane is pretty bad and the biggest controllable source of methane is cows. Cows fart a lot. According to the article, about 300 liters of methane gas per day. The fartpack collects that methane before the cow farts and stores it in the cow’s backpack. The methane can be collected at the end of the day and turned into fuel. The fuel is then burned and turned into carbon dioxide, but this is a good process. It’s carbon-neutral. The carbon dioxide from the fartpack would’ve already been released into the atmosphere as methane and then turned into carbon dioxide in ten years. The fartpack never lets the methane into the atmosphere and gives us a renewable source of carbon fuel. The article indicates that strapping fartpacks on to every cow at a dairy farm isn’t cost effective, but its a cool new green energy idea that some farmers might get grants for. Pretty soon you might be driving a car powered by cow farts!